When Almevary Balik was but a few months old, as her parents claim it, her first words were puppy foot. As impressive as it was that she spoke at such a young age, and that the utterance was composed of two words, it was even more impressive when considering how unlikely it is she even once heard the pair combined. Puppies have paws, rather than feet, and her family was made up of strictly cat people. She had essentially come up with a term on her own, which is something adults do every day, but infants, not so much. The phrase stuck with her, as family members would brag to anyone within earshot how intelligent and precocious Alma was. She herself couldn’t hear the end of it either, and when her rock band was trying to decide on a name of themselves, it was the obvious choice. Alma was the band’s frontwoman, and business leader. There were many small venues available to perform in, but she knew which ones to accept, and which to turn down. She did her homework, researching bigger and bigger names that were at all involved in the music industry, tracking their movement. Basically, she was looking for them to be discovered without it being obvious. Though the gigs they chose did not necessarily pay well up front, knowing who was in the audience paid off later. In months, they were skyrocketing to stardom, first by being an opening act for Peter Fireblood, and then being invited to tour with You’re Bad Grammar. 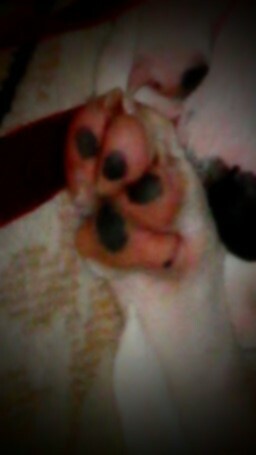 Puppy Foot was soon a global phenomenon, but good things are never meant to last. Alma started receiving uncomfortable messages from one of her fans. In once sentence, he would speak of their destiny together, then her brutal death in the next. She contacted the authorities, but they were unable to do anything about it without a name. Over time, her stalker grew bolder, showing up as a shadow behind her on the street, and then sneaking into her trailer to move objects around. Still, the police could not catch him, because he did not so much as show his face to her once. Theoretically because this distant gaslighting was becoming too impersonal, one night, he decided to take things to the next level, and confront her directly. She was alone in her apartment when a werewolf burst through her window, and started growling at her. She tried to reason with him, but he refused to back down. We may never know exactly what the stalker werewolf intended to do, for as he stood up and prepared to attack, Almevary Balik grabbed the nearest object; an elvish star flute. She swung it towards him, and sliced off his whole front paw. This distracted the stalker long enough for her to get away, and find help. He bled out in her livingroom before he could be arrested.